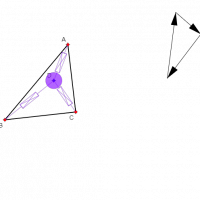 In the mechanical simulation, the actuator connecting point D to A exerts a constant force a, the actuator connecting D to B exerts force b, and the actuator connecting D to C exerts force c.
Press the hint button to see a geometric construction for this point. Under some circumstances the mass settles at one of the vertices. Can you work out what these circumstances are?